A Special 20th Episode Of What's the Move! hearthstone A Special 20th Episode Of What's the Move! Welcome to the new, community-oriented format for What's the Move! Beginning with the 20th episode of What's the Move, the series will be moving to a new, more community-oriented format. Welcome to the first two-part episode of What's the Move! Beginning with episode 20, I'll be presenting a tricky Hearthstone situation (as I always do) but I won't provide the "solution" as I normally do. Instead, I'll give the community time to debate and discuss what they would do in the same spot, then present my answer to the situation in the following episode along with a few of my favorite community responses. My hope is that this new format will foster more discussion and debate about Hearthstone, which will in turn lead to more improvement for all of us as players. The goal of this entire series is to improve at Hearthstone, and what better way to improve at Hearthstone than to debate and discuss its many nuances? Here I am playing my favorite deck in the current meta, Combo Dragon Priest. We're on The Coin against Dude Paladin, and my opponent just spent their turn 4 playing Call to Arms into Righteous Protector, Argent Squire, and Drygulch Jailor. We have plenty of options available this turn: we could Mass Dispel, we could Duskbreaker, and we could play some combination of Radiant Elemental and Potion of Madness. It's obvious that we have the stronger late game and that our goal in this spot is to slow down our opponent's aggression - but what's the best way to go about that? What would you do in this situation? Let us know in the comment section here on Icy Veins or tag me in a tweet with your response! As always, I highly encourage readers to submit their own situations to What's the Move! With the new format its now easier than ever. All you need to do is play with a deck tracker, send me the game's replay link, and include a screenshot of your situation and your decklist as I did above. Both the replay link and the two screenshots can easily fit in a tweet to @Aleco_P. I look forward to reviewing your submissions soon! I don't play a lot of priest so pardon me if I miss something obvious here. My play would be to use Mass Dispel to turn his board into 2/2 and a bunch of 1/1. Individually those cards dont give much of a threat. Their power comes from their abilities not their stats. Sunkeeper wont be a threat til the next turn allowing you to play duskbreaker to clear the turn after. Using duskbreaker now clears 2 minions but gives your opponent Silver Hands, which can lead into a knife juggler play or crystal lion, much more threatening cards. Agreed. Maybe a duskbreaker on turn 5? It's really interesting and even though it seems obvious for some ppl here I want to give a more detailed answer, Aleco put in some work on this so can I. So many plays are possible and one thing that I miss is which cards you have already played. obviously the coin but which were the other two cards? Mass Dispel would remove the Shields, deny the deathrattle as well as reducing his attack power by 1. Duskbreaker would remove the Shields, reduce his attack power by 4 but also triggering the deathrattle. Remove one Shield and kill the Drygulch (either giving you 3 dudes or him) and reducing the Palas board attack power by 1. My play: I think I would go for the Mass Dispel. You remove the shields, in case he has a Rallying Blade. I am not interested in the Potion of Madness play because it either gives him 3 dudes, which is obviously not good to do against a dude Paladin, or you get 3 dudes you don't want which is also bad in case he has a Divine Favor. You can follow up with a Dusbreaker on your next turn without worrying about your elementals, as well as killing even more of his minions than you could do with the Duskbreaker this turn. It might be bad if he had Blessed Maul but you could handle the damage, I guess. Purifier's Maul would be pretty annoying. The Duskbreaker could minimize the damage you will take on your opponents turn especially if he has a Blessed Maul but I think on the long run you will feel like you wasted your Duskbreaker, unless you are lucky enough to draw your 2nd. Potion of Madness + Hero Power and gamble to plan an even more efficient Duskbreaker next turn but this would leave the deathrattle effect up, that's why I don't like this play. So many plays are possible and one thing that I miss is which cards you have already played. obviously the coin but which were the other two cards? 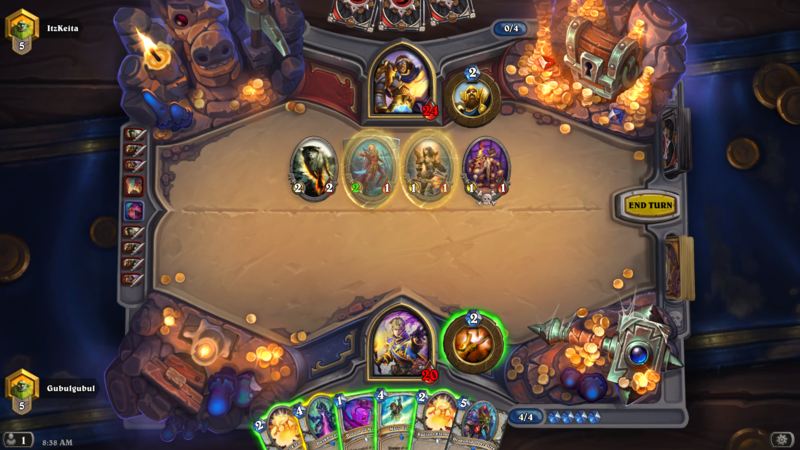 The two cards were Tar Creeper and Kabal Talonpriest. Hi there, I also like playing "innerfire-Combo-Priest" and "Spiteful-Dragon-Priest" a lot. I like your anylization Caldyrvan and you are rightfully so pointing out the different takes/approaches to resist the early aggression there. I my opinion the more defensive you play the harder it becomes to closing out the game in your favour. Using the Duskbreaker here is a total waste, since turn 5 could allways bring a "Stand against Darkness", a second "Call to Arms", also keeping your handsize kinda big is a problem because of "Divine Favour". sure the weapon could be also pretty nasty on the Paladin Players turn 5 but, it wouldn't be as threatening in long term as a refill mechanism or actually minions. What we really wanna do is swing the board as hord as possible in my opinion. So since Duskbreaker is out of the question because it is your only removal right now for answering wide boards. Why 2 recruits? Simply because of 4 reasons. 1. Your heropower is to slow at this point, it doesn't effect the board, and even though it is able to prolong your stand against his threats I do no it's a troublesome decision - dare to say misplay - to actually just heal your face here. 4. Most importantly you want to have one of the combo enablers (Radiant Elemental) still to be available - IMO - and even though you can end up with your 1 more card in your hand if you use both R.E. here, it's not that good in any possible follow-up turn 5 play of your oppenent. Because putting 3 bodies on board is way better in this current game state than just 2, and yeah even if you have more stats in play with 2 R.E. - still we don't know the opponents cards, but I would stick to that plan. I like your answer. I have to add that I stopped my time to consider all plays I could do and what my opponent could do next turn and I was at 63 seconds before I decided I considered everything and started writing my post. It also forces your opponent into the worst possible turn from their side. You’re saying if you don’t begin to trade into me, you’re allowing me a discount of 1 or 2 mana on the next turn. Decent players know the combo deck and are aware with any sort of mana discounts left on board, it can go off. So now think like the Paladin: Can you afford to let your opponent double Shadow Visions into PW: Shield, Potion of Madness, Divine Spirits? No because all of those things allow a board of 2/3 to dismantle your board. If you just try to ignore the reality of that board state, you likely lose 9/10 of those games. You also saw the priest do something besides Duskbreaker on 4 into your full board, so you might be more inclined to think they didn’t have that card in hand. So if you do have a reload like Stand or Call you’re more likely to trade your board in to prevent shenanigans and reload with one of those cards. Now you’re the Priest again and which of those scenarios are bad for you? None. They’re all fantastic. If they Weapon an Elemental and make a dude, and ignore your board otherwise you can Duskbreaker, getting all but the buffed Argent Squire, that leaves you with a 3/3 to their 2/2. If they trade in and refill via Stand or Call 2, then you Duskbreaker and drop a dude on the back end of that. If they just weapon and make a dude and trade into your board because they respect the elementals, that lets you safely develop the Operative. If they Blessing or some other buff you Dispel, trade and drop some of your own dudes. In all scenarios you’ve likely won the game moving forward. Also to consider, it’s now heading into turn 5/6 so you don’t care about Elemental discounts for combo anymore, that’s more to punch slow control decks before they can react. You need board in aggro. You have Operative and other stronger cards you want to develop later, they’re not keeping up with that, until a possible Stand and Level Up, but 8 is a long way and that’s a very specific combo featuring a 1-of. Plus in more than half the scenarios above you’re holding onto that Dispel anyway. Think about the whole game, not just this turn if you want to win. I went elemental, madness, dude, dude too though I nearly went madness, dudeX3 (elemental could be worse if you play the duskbreaker soon, but dudes are more vulnerable to pings from juggler). I think you clearly can’t play the duskbreaker as you’re giving him fuel for reload without holding anything that deals with it. Mass dispel sets up a good duskbreaker but seems likely to force duskbreaker the following turn and potentially gives them a good divine favour. Mass dispel might be better on a turn after they’ve buffed dudes too. My move would be 2 elementals + potion on jailor, and hit the taunt. I had similar situation a few days ago, and it was really fun battle. Can't remember if i won or lost though. I believe Mass Dispel would be the move here, it would clear out the divine shields and remove any future threat of the deathrattle that would spawn the silverhand recruits. I would nurse the duskbreaker until next turn to allow them to potentially overplay a few more minions and set you up for a solid midrange game!